Summary: The Golden Army itself, truly unstoppable. Fabulous entertainment. I saw The Dark Knight and Hellboy II: The Golden Army back to back and a lot of people have asked me which I liked best. I can’t really say, for though they are both based on comic books, and are both superhero movies, its like comparing apples and oranges; where The Dark Knight is brooding and existential and angsty, Hellboy II is gleefully inventive, romantic and most of all, funny. Kudos, too, to the design agency that created the poster campaign. Those posters are awesome. We rejoin Hellboy (Perlman) – also known as Red – living with his girlfriend Liz (Blair) and their clutter of cats at the top secret Bureau for Paranormal Search and Defence. Red is struggling with domesticity – as he complains to Abe (Jones), the acquatic empath, Liz expects him to save the world AND do the dishes – whereas he just wants to relax. Of course, when you are a occult detective with horns and a tail, fate is bound to have other things in store. An ancient truce has existed between humankind and the original sons of the Earth – the elves – but naturally humans have forgotten it and so break it in their careless fashion. Prince Nuada (Goss), weary of centuries of deference to mankind, is plotting to reawaken The Golden Army: unstoppable killing machines who will rid the world of the plague of humanity and free the magical creatures to take back what was originally theirs. And only Hellboy – and his band of superheroes – can stop him and save the world from annihilation. Guillermo del Toro here succeeds in harnessing all his visionary imagination and inventiveness to a major studio blockbuster to create what is perhaps the film of the summer. For all that this is studio fodder, it still feels incredibly personal – anyone who has seen any of del Toro’s other films will recognise all those deft touches. The credit sequence, for instance, is full of clockworks and cogs – a visual introduction to the Golden Army, but also a favourite image of del Toro’s. The magical creature effects are utterly marvellous – tooth fairies have never been more scary, and yet also strangely sweet, just like the fairies in Pan’s Labyrinth; the elemental nature spirit has to be seen to be believed, and there is a ecological message that is lightly handled and never preachy. That isn’t to say that Hellboy doesn’t have his moments. His love of publicity means that the Bureau’s security is becoming compromised, and not everyone loves the ‘freaks’. Saving the world is fun, but being called ugly while doing it is less so. And then there’s Liz. Though she is coming to terms with her pyrotechnic abilities, she is still wary of her powers and not entirely comfortable being part of the world of the BPRD. If there is one failing, it’s the villain. 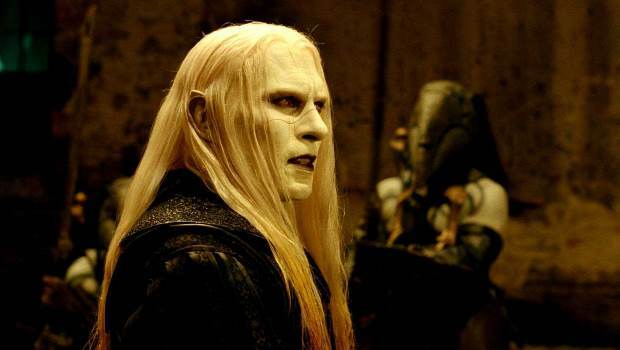 Luke Goss is fine, but we never really see that much of Prince Nuada, apart from his cool martial arts skills. (And for some reason he reminded me of Julian Sands, which is never a good thing.) But this is really a quibble when there is so much else to love. Red and Abe swigging beer and singing ‘Can’t Smile Without You’, and trying to deal with the age old question of women AND saving the world; the annoying German agent, Johan Krauss (voiced by Seth MacFarlane); the magical market; the Irish stone giant; Prince Nuada’s troll sidekick; the climactic battle in the huge underground city. The Golden Army itself, truly unstoppable. Fabulous entertainment. The four hours of extras serve up everything you could need to know about Hellboy II. There are the usual commentaries from director del Toro and cast members Jeffery Tambor, Selma Blair and Luke Goss, together with deleted scenes, and set visits. One of the stand out sections of the film is given a look when del Toro tours the Troll Market, also featuring sketches and production rolls, and there is also a Zinco epilogue animated comic. Fans will be thrilled by a 140 minute documentary which takes every element of the filmmaking process with interviews, a look behind the scenes, the evolution of the script, adding the special effects to the shooting and an insight into the imagination of del Toro.